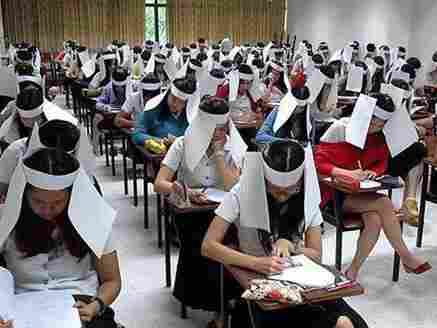 Embarrassed, Thai University Removes Anti-Cheating Hats : The Two-Way A photo of Kasetsart University students wearing the cumbersome headgear during an exam went viral, garnering disapproval. Wandering eyes at test time is hardly a new problem, but a photo of one classroom's unique solution has proved an embarrassment for Kasetsart University in Thailand, The Bangkok Post reports. The university says it has decided to discontinue special "anti-cheating" headgear that was designed and constructed by the students themselves to be worn as a deterrent to cheating during exams. The paper hats, worn by students in a textiles class at the college in Bangkok, consist of a headband with two letter-size blank pages draped on either side of the head. The photo above of students wearing the "anti-cheating helmets" as they sat for a recent examination went viral after it was posted to the university's alumni Facebook page (the photo seems to have since disappeared). The faculty's dean, assistant professor Tanaboon Sajjaanantakul, told the Post that comments on social media "had drawn a mixed reaction from the public and caused a lot of stress to lecturers in the faculty." Natdanai Rungruangkitkrai, the textiles course lecturer, said the hats were the idea of his students and grew out of a discussion about ethics. When he asked his class how to prevent cheating, they came up with the hats. Natdanai says no one was forced to wear the cumbersome headgear, but about 90 students chose to do so, and they were responsible for making their own. The Post writes that Natdanai "regretted that the issue had received such a strong negative response from the public, adding that he had tried to encourage creativity during his eight years in the job." "'The students were excited and having fun. No one refused to make a hat. I admit [the response to the hats] has been stressful, so we decided to stop using this method and will talk with students to find other more acceptable ways to prevent cheating,' said Mr. Natdanai." One student was quoted as saying she thought the hats were an effective deterrent: "It is quite normal that people try to cheat in an exam, so the hat helps avoid distractions while doing the test," Rawiporn Buasaeng told the newspaper. "I feel very bad, and angry, that this has been seen as bad by outsiders."